There’s no doubt that North American manufacturers have become educated on the basics and nuances of servo-driven stamping presses. But we’ve noticed that there are some questions related to energy management and cost of ownership as compared to traditional mechanical presses. 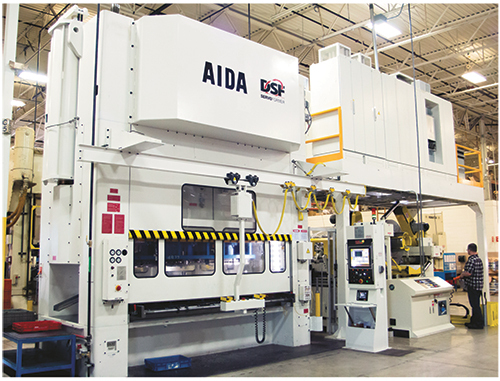 With that in mind, MetalForming reached out to an industry expert, Shrinivas Patil, product manager for Aida-America (www.aida-global.com) for his perspective. Here he details energy management and return on investment (ROI). MetalForming: Metalformers have expressed concerns about energy usage and how servo-driven presses compare in energy management. Can you address how press builders have leveraged technology to reduce energy usage, especially energy demand during peak rate periods? Servo-driven presses employ technologies such as capacitors and smart systems that efficiently manage energy use, helping to provide improved returns on investment. Patil: Mechanical presses use flywheels to store energy and then provide it during forming operations. On the servo-driven-press side, there are a few alternatives. Some press builders employ a flywheel-based energy-management system (EMS). For our part, we choose a capacitor-bank EMS, where capacitors store energy in DC form, with capacitor sizes based on a user’s speed and stroke requirements. Here, the capacitors are charged continuously, and when the servo motors need excess energy, such as when drawing or coining, the capacitor banks bump up the supply. During the nonforming cycle, incoming electricity charges the capacitors so that they can supply extra energy when needed. A good analogy is that of a hybrid automobile, where during city driving braking action supplies energy back to the batteries, and when accelerating the cylinders supply energy with extra energy supplied by the batteries. A proprietary smart EMS studies press speed and the amount of energy stored in the capacitors and knows how much energy is required. With all of that data, the system routes energy back and forth into and out of the capacitors to help smooth the peak-energy curve and lower the amount of electricity needed from the incoming line. With a system such as this, energy requirements can be less than 50 percent of that for typical servo-drive systems. With the ability to store energy and use it as needed, servo-driven presses save a large amount of electricity as compared to similar-sized traditional mechanical presses. In addition, servo-press users have benefitted from utility-company green-energy rebates. So there are opportunities to save on energy costs when using servo presses. For example, one automotive OEM claims to have saved 32 percent on energy costs as compared to producing the same parts on a mechanical-press line. MetalForming: Can you discuss cost of ownership of servo-driven presses versus traditional mechanical presses in terms of the EMS? Patil: In our case, with the capacitor banks being modular in design, no single component failure will shut down production. This is unlike traditional mechanical presses with flywheels and brakes, where, if bearings, belts or a motor fails, everything shuts down. A network of multiple capacitor rows and columns prevents catastrophic failure, which reduces downtime. These capacitors offer 35-plus years of life. Clutch and brakes require extensive preventive maintenance every five years or so, but capacitor banks are maintenance-free once they enter production. And, capacitor replacement takes 4 hr. as compared to a few days every five years for clutch and brake units. In addition, some components such as bearings and motors are long-lead items, whereas capacitor banks are stocked and can be delivered and installed in less than a day. It is commonly accepted that servo-driven presses bring advantages when working with complex parts and challenging materials, but the same can hold true for dedicated part runs where users can take the time to fully optimize servo-press motion profiles. Fewer jobs and longer runs allow for full profile optimization that can net productivity improvements of 50 to 75 percent. 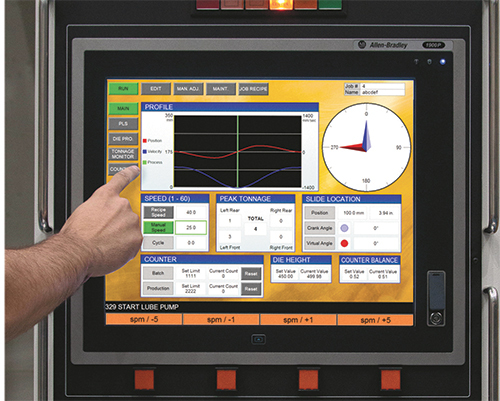 Today, remote monitoring of electrical press components such as capacitors on a regular basis reduces the likelihood of unscheduled maintenance. For example, capacitors can be monitored and the degradation rate determined, which allows simple maintenance and replacement to occur before major problems present themselves. With all of these advantages, downtime for EMS-related maintenance can be less than 10 percent that of EMS downtime on traditional mechanical presses. MetalForming: EMS is a component of an ROI equation. Overall, can you compare servo-driven to mechanical presses in ROI? Obviously, a more-capable servo-driven press can pay off when dealing with complex parts or challenging materials, but what about when employed by dedicated-product stampers? Will increased speed or decreased tool wear be enough to justify what may be a 30-percent premium on the purchase price of a servo-driven press? Patil: For stamping dedicated products, ROI is in fact quicker. In applications that we have studied, ROI for the premium is nine to 12 mo. For a dedicated part run, where you may run the same or similar jobs 24/7, you can fully optimize the motion profile because you can take more time to arrive at the ideal profile. When running a greater variety of jobs, a stamper cannot optimize every job to the fullest extent due to the need to keep up with production and with customer demands. Fewer jobs and longer runs allow for full profile optimization and productivity improvements of 50 to 75 percent, thus the reduced ROI. These ROIs are not even considering improvement in tool life and part quality, and reduction in scrap and setup time. Also, some stampers, because press speeds can be reduced and optimized during forming, use less lubrication, which also assists in a more rapid ROI.